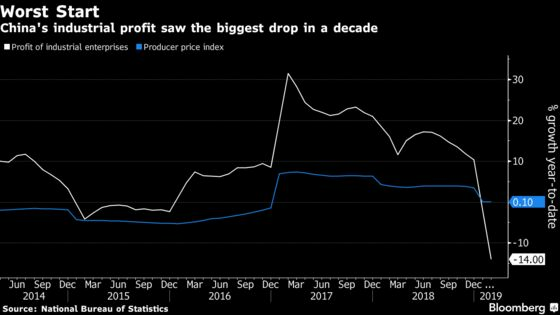 (Bloomberg) -- The profits of Chinese industrial companies had the worst start to a year since the global financial crisis due to weaker factory inflation, slowing production and seasonal factors. Manufacturing companies’ profits in January and February declined 14 percent from the same two months a year earlier, the National Bureau of Statistics said in a statement. That compares with a 1.9 percent drop in the single month data for December. Tax reductions will provide some relief to those firms this year, while global demand will likely stay weak amid the slowing European economy and trade talks with the U.S.
Industrial profits are a lagging indicator and probably won’t recover until September, months after the economy starts to improve, said Hunter Chan, a Hong Kong-based economist Standard Chartered Plc. "China’s plunging industrial profits will make it harder for the economy to transit to a self-sustaining recovery once policy-induced stabilization takes hold."